There was no shortage of wailing when H&H ­Bagels closed its Broadway storefront last month after 39 years: “Nooo!,” “NOOOOOO!! !,” and, finally, “NOOOOOO!!!!!!!!!!!!!!!!!!!! !” read three typical tweets and ­Tumblr posts. Yet amid the elegies on baked goods lost, there emerged a steely counterposition. In this view, the H&H-style bagel is an abomination, the reason a real bagel has become a niche rarity. The purists raising these cries recall what New York’s pain ordinaire once was but almost never still is: the classic “cement doughnut,” with a crunch to the shell and a great chewiness to the interior—supreme on the palate, if treacherous to the jaw muscles. Babies were known to teethe on these things, which went stale within hours, becoming only slightly harder than they had been in the first place. (The idea that New York water is the secret ingredient, by the way, turns out to be bunk. Flavor and texture come primarily from three things: the flour’s protein content, how the dough is kneaded, and boiling before baking.) Consumers of this classic bagel—let us call them the Iron-Jawed Traditionalists—would not have their breakfasts any other way. In the old recipes, the dough contained a tiny bit of malt syrup, to feed the yeast and help the dough rise. 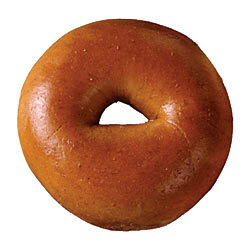 But then the bagel veered off course, as was expertly laid out by the food writer Corby Kummer in this magazine fifteen years ago: Bakers started using a much larger dose of sweetener, often in the form of corn syrup, delivering what Kummer called the three S’s: sugar, softness, and size. The H&H bagel has all three, being a candy orb roughly twice as big as the oldsters were and so edematous that it often has no hole, just a navel. When toasted it tastes, ­Kummer noted, surprisingly like a campfire-browned marshmallow. This bastardization wouldn’t be a big deal if H&H were an outlier producing an interesting variant—something like the City Bakery’s pretzel croissant, one of the most delicious things in existence. The problem is that many people, even many New Yorkers—call them the Toothless Revisionists—have come to believe that the squishy-sweet H&H-style bagel is the quintessence of the form. Just as the economist Sir Thomas Gresham once posited that bad (i.e., debased) currency drives good money out of circulation, bad bagels, with their easy chew and cozy sweetness, made the good seem ascetic, rendering them all but extinct. The pretenders are an unstoppable, invasive species, like kudzu or the Kardashian sisters. When H&H shut down, the Traditionalists took the opportunity to wave their tattered, salmon-stained flag. Time.com’s Josh Ozersky—who’s built a food-critic career on my-mozzarella-guy-is-­better-than-your-mozzarella-guy one-upmanship—filed a story headlined BAGELS: AN AMERICAN TRAGEDY. On the Times website, Mimi Sheraton, perhaps the ultimate authority on the subject, accused H&H of “pandering.” My mother doesn’t like them either. Really, though, in the Bagel Wars, it’s been many years since the last chopper left the rooftop. Saigon fell long ago, done in by H&H and its fellow travelers, those toroidal Jane Fondas, the enemies within. It’s time to move on, as there are more pressing international issues to talk about. The Bialy Shortage, for instance.